CBSE conducts the CTET Exam twice a year to fill the teacher vacancies across India because as per act by government TET (Teacher Eligibility Test) is the essential qualification for a person to be eligible for a teacher. Central Board of Secondary education will complete the CTET Examination on 7th July 2019 in two sessions (Morning & Evening) all over India. The candidate, who got the top marks will get the top rank in CTET Examination. So, the candidate, who wants to serve in the central government school, will have to perform well in July 2019 examinations. A large number of candidates appeared in this exam. Those, who have attended the exam might be waiting for the result. CTET answer keys are available on websites before the release of CTET Result 2019. The CTET cut off marks decided on the basis of a total number of appeared candidates and the highest marks obtained. Here we are providing expected cut off marks. So, the candidate can check the CTET JULY Answer key and check the cut off marks. The candidate who got expected cut off marks can prepare for next rounds. On this page, the CTET answer key for Paper 1 and Paper 2 is provided. As exam was held in two sessions, the Different set code was used for both papers. Answer keys will be released for different set codes. Paper 1 - is for candidates who are willing to teach for classes I to V.
Paper 2 - is for candidates who are willing to teach for classes VI to VIII. Those, who want to analyze CTET JULY 2019 examination result can download the answer keys according to their set codes & sessions in which the candidate appeared in CTET exam. These answer key will help the candidate to know the expected marks they are securing in the examination. These answer keys give satisfaction before the result. Candidate can have an idea for the chance of selection. Instead for searching December 2019 answer key, download set wise answer keys provided on this page. 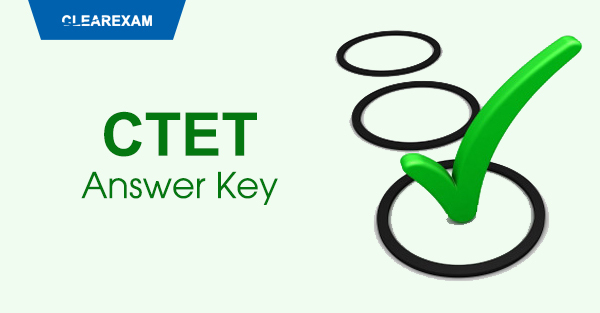 candidate have to follow few easy steps to download CTET 2019 answer keys. Step 3 Select Set number of CTET December answer key. Step 4 Save the displayed answer key for your set. Step 5 Finally Take a print out and check the answers. On the official website, CTET answer key 2019 will be released along with the Candidate's filled in OMR sheet. A public notice will be issued in leading newspapers regarding CTET answer key and OMR sheets. Now have a quick overview of CTET Exam first. The CTET (Central Teacher Eligibility Test ) is conducted for determining the eligibility of B.Ed degree holders for teaching jobs in government schools such as KVs, NVs etc. Private schools also give preference for CTET qualified Candidate in teaching jobs. Two separate papers are conducted for Classes (I to V) and classes (VI to VIII). The candidate also has an option to appear in both the papers. The unofficial key for CTET exam will be released soon after the exam, i.e within 1 or 2 days. Various private coaching institutes will release unofficial answer key for both the papers prepared by experts. Hence, it helps the candidate to estimate their score. How to calculate CTET score on the basis of OMR Sheets and answer keys. Candidate can calculate their score with the help of OMR sheets and answer keys released on websites. OMR sheets can be downloaded using Roll number and login details. Each correct answer will score 1 mark and there is no negative marking for the wrong answer. Candidate will be able to get a copy of their OMR sheet on the payment of Rs. 500 per OMR. The fee can be paid through Demand draft in favor of Secretary, Central Board of Secondary Education drawn on any Nationalized Bank and payable at Delhi. In any case of discrepancy in the answer key, a candidate can submit the objection to CBSE through the official Portal. The department will provide a schedule for all the activities related to CTET answer key on the official website. Sometimes candidates are not satisfied with answer keys. In that case, a candidate can submit the objection through official portal. Candidates are advised to check official Portal for the opening of object submission. If the objection is valid then official will release the modified answer key. Once the official will provide the answer key after object submission, then the result will be declared as soon as possible. Candidates must compare the cut off marks of this year with the last year cut off marks. They must be slightly changed as per the difficulty level and the number of participants appeared in Exam. Match the answers in OMR sheets with answer key. In the end, add all the marks for correct answers & you will get expected CTET score. The minimum qualifying marks for CTET is 60%. Thus the candidate securing (>=60%) will be declared as CTET qualified. The official notification states, "No request for Re-checking, Re-assessment, Re-evaluation or scrutiny of OMR sheets will be entertained. No correspondence will be entertained in this regard."